It began as a fishermen’s festival, with prayers for safety as men ventured out onto the ocean waters. Today, the Haarii festival is a time for festivities, and dragon boat races. Your opportunity to experience the excitement is early next week, as the Naha Haarii moves into full swing at Shinko Wharf. 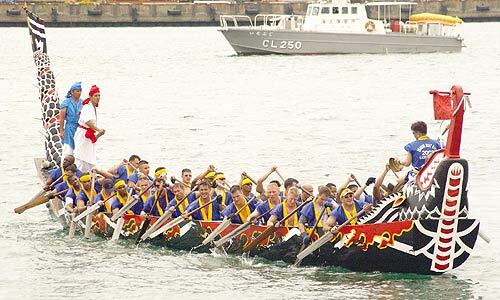 The festival begins Monday, May 3rd, and builds to the climax May 3rd when a full day of dragon boat races produce winners in several categories, including military men’s teams and military women’s teams pitting American and Japanese crews. The action takes place in sabani, small intricately carved and painted dragon shape fishing boats. The event in Naha, and a similar festival in Itoman to the south, h as been a tradition for hundreds of years, as residents pay homage to those who making their living on the sea. The haarii was first brought to Okinawa in the 14th century, when the island was the hub of the Ryukyu Kingdom and dealing in trade with many Asian countries. Tradition has it that the haarii was a ceremony to pray for rain, with dragons the instrument to bring clouds and rain by their fighting. When brought to Okinawa, the haarii was designed for fun, although it soon became a fishermen’s tradition in hopes of fair weather and good fishing. The Naha Haarii Festival is the first of countless festivals across Okinawa that will run through November. It features plenty of live entertainment, food and game booths similar to American carnivals, beer, awamori and entertainment activities for the kids. The festival is open each day, and is capped in the evening with fireworks. The Naha Haarii Festival is free; there are no admission charges. The way to the festival is easy. Finding a parking space is yet another story. Travel south on Highway 58 from the military bases. After passing Camp Kinser, look for Aja Port sign. Turn right at the intersection and proceed west. At main traffic light (big building with round restaurant on top), begin looking for a parking place. Good luck. Parking runs Y300~500 per hour.